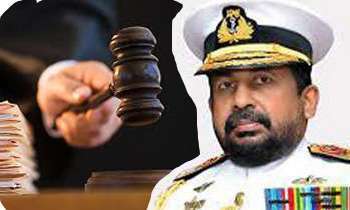 Chief of Defence Staff (CDS) Ravindra Wijegunaratne, who was in remand custody, was released on conditional bail by Fort Magistrate Ranga Dissanayake today. These are the War Heroes. But for them we would still be in the "Bombs" era. @chari, you got the term wrong. War heros are the ones who would scarifies even their life to do the right thing and do it without fear. Not helping criminals! Don't shame the real war Heros!!! A real hero will never be accused of these crimes. Many mistake that a group of a fighting unit has both real heroes and shadow heroes and the latter get undue credit for the combined effort. Just when we thought we have faith in the judiciary, .... a bail out on criminal conduct by the highest official in the military. The offense under which the CDS is charged is non bailable. Conditional or unconditional period !